There are many catastrophe bonds that are potentially at risk from a major landfalling Hurricane Irma, with as much as $14 billion of the outstanding cat bond market holding some level of exposure to Florida or U.S. east coast named storms and hurricanes. As hurricane Irma continues on its track towards a Florida landfall with little to stand in the way of a major and catastrophic event unfolding on the peninsula, it’s important to remember that U.S. hurricane risks remains the major contributor to the cat bond markets expected loss and Florida is naturally ground-zero. Standard & Poor’s has provided a list of 13 rated catastrophe bonds it sees as risk from hurricane Irma, detailed further down this post, but there are many more which are at risk, as the vast majority of the market issuance is not rated by any rating agency. In fact, a significant proportion of the near $30 billion of outstanding catastrophe bonds that we track here at Artemis hold some exposure and could be in hurricane Irma’s path. Of course the collateralized reinsurance and private ILS market is also exposed, perhaps even to a larger degree. 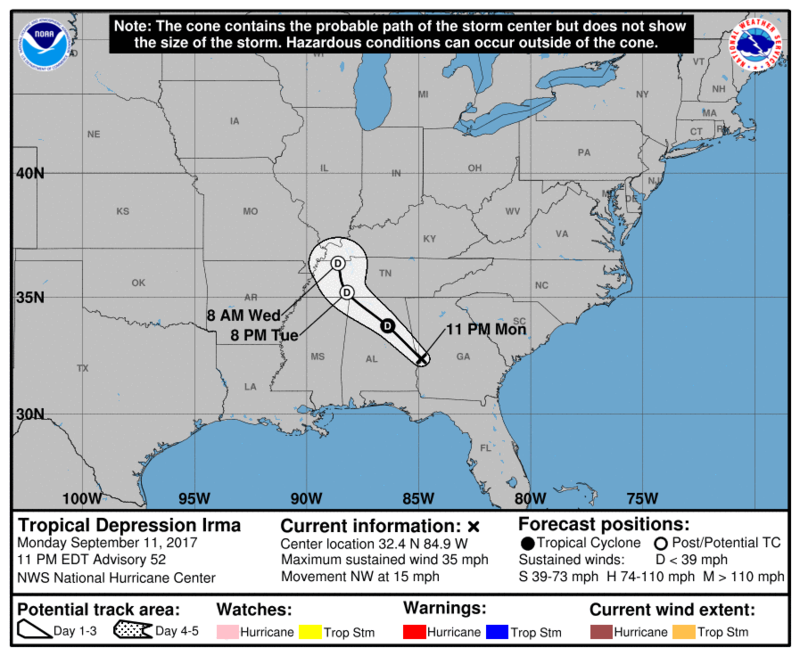 With Irma on track for Florida that puts many cat bonds at risk straight away, but add in the exposures on the east coast, as some forecast models still show Irma grazing Florida and making a landfall further north instead, still at major hurricane strength, and you can say that the vast majority of the U.S. wind exposed cat bonds are exposed to Irma. It’s generally accepted that U.S. wind (so named tropical storm and hurricane risk) makes up somewhere around 60% of the cat bond market’s exposure. Not every U.S. wind exposed cat bond sits in Irma’s path though, but we can count approximately $14 billion of the outstanding market which could be exposed to various hurricane Irma landfall scenarios. This includes all cat bonds that feature U.S. hurricane risk and do not explicitly exclude Florida (as some do). $1.651 billion explicitly mention Florida as a covered state, while many more just cover all hurricane exposed states of the United States, so include Florida. Of the $14 billion potentially at risk from hurricane Irma, $7.27 billion are exposed on a per-occurrence basis, while $6.6 billion have aggregate exposure. The aggregate cat bonds could, in some cases, already have suffered some erosion to their deductibles and retention layers, potentially increasing the risk from future storms. Based on the current landfall track forecast from the NHC the number exposed shrinks considerably, but we can estimate that as much as $3 billion to $6 billion of the outstanding cat bond market could be exposed (so at risk and depending on many, many variables, not a definite loss at all) to hurricane Irma striking the Miami area a devastating blow. It’s really important to note that the risk to many of these exposed catastrophe bonds is minimal, although some are likely to be deemed particularly exposed and could trade in more volume today. Given catastrophe bonds have very different and individual payout factors just how many might be triggered is impossible to forecast right now. If Irma maintained its intensity and smacked Miami head-on then it would be a significant percentage of the exposed bonds, but even a dip to category 4 would see some cat bonds escape losses and take the intensity down to Cat 3 and many more would not face any loss. An absolute worst case scenario, such as the $131 billion realistic disaster scenario, could see an enormous loss for the catastrophe bond market, other insurance-linked securities (ILS) and of course reinsurance companies. But as the scenario lessens in severity fewer losses would be seen, so there is considerable uncertainty right now and it’s not possible to make predictions with any level of accuracy yet. Today being Friday it is crunch time for the cat bond investors and ILS funds holding catastrophe bonds, as bonds do not trade at the weekend. That means if investors do want to offload their exposure they need to do it today, which means it could be a very busy day for the cat bond trading desks. Here’s S&P’s article on the catastrophe bonds it rates that are exposed to hurricane Irma. on these issues remain unchanged. contribute 92.2%, 2.3%, 1.9%, and 1.7%, respectively, to the modeled annual expected loss. The other states that contribute to the expected loss are Alabama, Mississippi, and Georgia, which make up the remaining 2%. Losses are calculated on a per-occurrence basis. The covered loss amount is based on insured industry losses. The attachment and exhaustion points are $1.501 billion and $2.342 billion, respectively. If this amount exceeds $68 billion in the covered area, a principal reduction could be expected. Georgia contribute 37.9%, 6.2%, 3.6%, 3.1%, and 2.7%, respectively, to the modeled annual expected loss. Losses are calculated on an annual aggregate basis and the current risk period began on April 25. The covered loss amount is based on insured industry losses. We are awaiting information as to whether losses from Hurricane Harvey exceeded the franchise deductible of $110 million. The attachment and exhaustion points are $2 billion and $2.983 billion, respectively. attachment and exhaustion points are $2.285 billion and $3.212 billion, respectively. attachment and exhaustion points are $1.559 billion and $2.285 billion, respectively. • $110 million Residential Reinsurance 2016 Ltd. Series 2016-I class 13 notes (‘BB-(sf)’): Hurricanes contribute 76% to the modeled annual expected loss. The Southeast, the Mid-Atlantic, Florida, and the Gulf contribute 21%, 20%, 12%, and 6%, respectively, to the modeled annual expected loss. This is an annual aggregate transaction that covers severe thunderstorms and earthquakes (including fire following) as well. We are awaiting information as to whether losses from Hurricane Harvey exceeded the franchise deductible of $50 million. The attachment and exhaustion points are $2.050 billion and $3.065 billion, respectively. • $150 million Residential Reinsurance 2016 Ltd. Series 2016-II Class 3 notes, (‘B-(sf)’): Hurricanes contribute 81% to the modeled annual expected loss. Florida, the Mid-Atlantic, the Southeast, and the Gulf contribute 24%, 18%, 14%, and 5%, respectively, to the modeled annual expected loss. Losses are calculated on a per-occurrence basis. The attachment and exhaustion points are $1.559 billion and $2.285 billion, respectively. • $170 million Residential Reinsurance 2016 Ltd. Series 2016-II class 4 notes (‘B(sf)’): Hurricanes contribute 82% to the modeled annual expected loss. Florida, the Mid-Atlantic, the Southeast, and the Gulf contribute 22%, 19%, 13%, and 4%, respectively, to the modeled annual expected loss. Losses are calculated on a per-occurrence basis. The attachment and exhaustion points are $2.285 billion and $2.775 billion, respectively. • $150 million Residential Reinsurance 2017 Ltd. Series 2017-I class 13 notes (‘BB-(sf)’): Hurricanes contribute 76% to the modeled annual expected loss. The Southeast, the Mid-Atlantic, Florida, and the Gulf contribute 21%, 20%, 12%, and 6%, respectively, to the modeled annual expected loss. This is an annual aggregate transaction that covers severe thunderstorms and earthquakes (including fire following) as well. We are awaiting information as to whether losses from Hurricane Harvey exceeded the franchise deductible of $50 million. The attachment and exhaustion points are $2.050 billion and $3.065 billion, respectively. • $125 million Tradewynd Re Ltd. Series 2013-1 class 1 notes (‘B+(sf)’): Hurricanes contribute 69% to the modeled annual expected loss. Florida, the mid-Atlantic, and Southeast contribute 63%, 7%, and 2%, respectively, to the modeled annual expected loss. There is some additional exposure in the Gulf and Caribbean that collectively contributes 1.4% to the modeled annual expected loss. Losses are calculated on a per-occurrence basis. The attachment and exhaustion points are $4.5 billion and $5 billion, respectively. • The four Horseshoe Re II issuances (all currently rated (BBB+(sf)) from segregated accounts LC1100, LC2100, CF5000, and FF5000 are also exposed to Hurricane Irma, but they all have very low attachment probabilities of 0.05%. U.S. hurricanes contribute between 60% and 83% to the modeled expected loss. The highest exposure in each segregated account is in Florida. All four issues provide protection on an annual aggregate basis, so even if they do not attach, we might see a reduction in the retention that could lead to a downgrade. These bonds have the greatest exposure to Irma based on the current track. but have no exposure in Florida. The East Lane Re VI Ltd. issuances have almost all of their exposures north of Virginia. The percentages shown reflect the contribution attributable to hurricanes, not all the covered perils. Details on all of these catastrophe bonds and many more can be found in the Artemis Deal Directory.